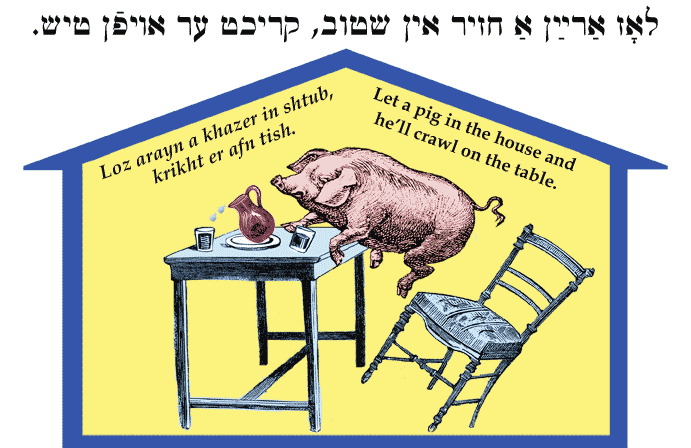 Yiddish Wit: Let a pig in the house and he'll crawl on the table. לאָז אַרײַן אַ חזיר אין שטוב, קריכט ער אויפֿן טיש. Loz arayn a khazer in shtub, krikht er afn tish. Let a pig in the house and he'll crawl on the table. Loz a hunt af der bank, shpringt er afn tish. | Let a dog on a chair and he'll jump on the table.